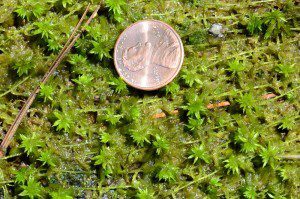 You are here: Home / General Interest / Here Come the Bryophytes! 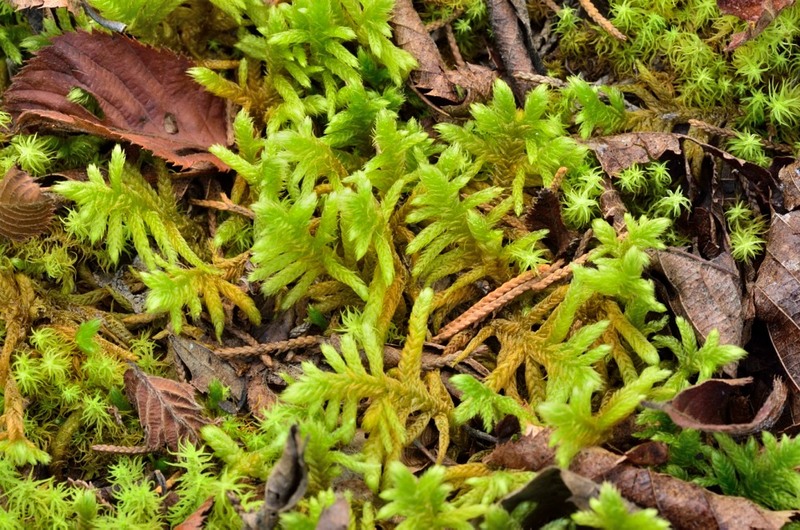 All of a sudden, mosses, liverworts, and friends are on a minor upswing in popularity. That thin green mat cushioning your feet and plastering tree trunks, that lowly layer of who-knows-what, is now more popular with the botanist and gardener than ever; it has spawned new field guides, classes, and restoration projects, as well as works of non-fiction, novels, and poetry. 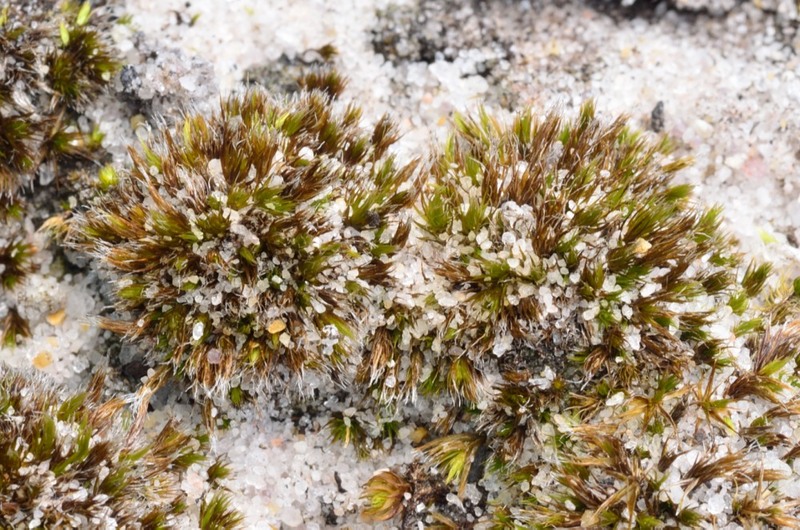 This species, Rhytidium rugosum, and the one with it are characteristic Bryophytes of limestone exposures at The Cedars. I know this mainly because I, too, have been sucked in. I had always been scared of “doing” bryophytes (mosses, liverworts, hornworts) due to their cryptic nature, apparent difficulties inherent in identification, and the lack of training and equipment. But this past summer, I finally took the plunge and enrolled in a course at Highlands Biological Station (N.C.), a move which brought me back to the rivers and steep escarpment slopes that taught me my first lessons in botany. Everyone knows Sphagnum moss! This one is really tiny; in a wet depression on South Quay Sandhills Natural Area Preserve. These little plants are very small, but they are not impossible to know, I was relieved to find out. Sure, your best friend is magnification, and plenty of it, but with this help the plants become quite accessible. My first treat: when I reentered this world of compound microscopy, I was immediately able to appreciate plant architecture in another way. What you see through the eyepiece – these skeletal and colorful patterns of symmetry – is built of cells, bumps, oil reservoirs, scales, and saw-like teeth. Having gotten used to viewing plants with incident light for so long, I had forgotten that transmitted light can illuminate each leaf like a window. A mix of species on fir bark on Mt. Rogers. This sort of coverage and interweaving of liverworts is standard fare up on our Highest peak (5,728 ft.). But getting back to the class. Tom Wieboldt and I travelled down together, bunked at the station, collected specimens half of every day with the instructor (over 300 specimens for me alone) and spent the biggest part of each day in the lab, learning how to learn them – with forceps, cover slips and manuals. Although we were given individualized instruction up until 9 P.M., we kept at it until quite late due to the overflowing shoeboxes and cardboard trays full of specimens. We shared a room with a graduate student who usually spent the night sporting a headlamp, prowling the station grounds for salamanders, his study subjects. We rarely saw him in a conscious state. Savanna moss, (Campylopus carolinae). A globally rare moss of droughty longleaf pine habitats. I left Highlands with a new set of skills and a sense of how broad and complex this field of study can be. The remainder of my field season was all the richer for it, and I was able to rediscover some rare and poorly known species found by botanists of previous generations. Learning the plants I’ve seen primarily as “background” for so many years will be a continuous project, so it is not surprising that sitting at the microscope has been a major winter occupation! 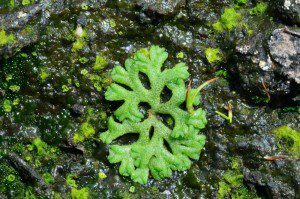 Liverwort, Riccia, lying flat on a layer of peat in Dismal swamp. The first and best to me is the truly international nature of bryology. Many species and certainly many genera show up on multiple continents. Some species which have only five outposts in North America are actually quite broadly distributed elsewhere. Reading about the flora of other countries can spawn a great sense of familiarity, and the very large and active group of scientists that study the group make you feel a part of something very large. The second would have to be the habitats where these plants thrive in their greatest profusion and diversity: steamy gorges, waterfalls, cloud forests, foggy tree canopies. All are prime bryophyte habitats and highly diverse in all of the other groups of organisms that draw our interest. 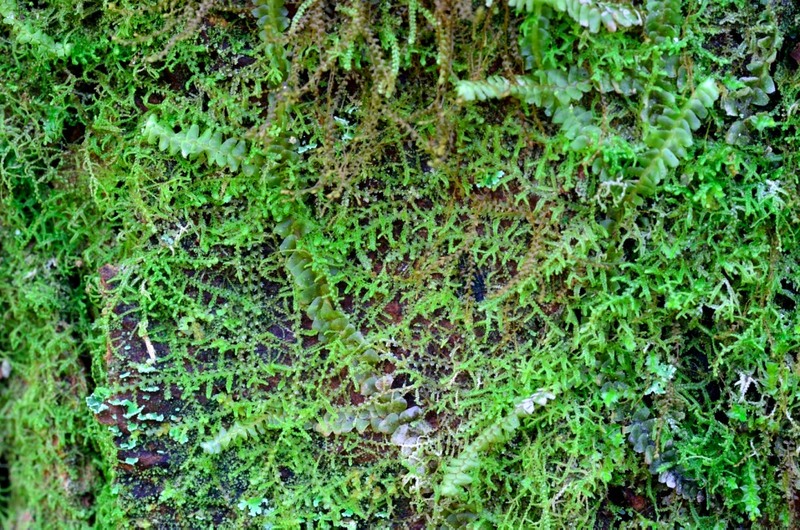 To see a mat of liverworts crawling up a tree is to see the equivalent of a forest understory – a world in its own right, complete with invertebrate predators and prey. Need an extra excuse to go take a hike, or climb a tree? Perhaps in Costa Rica? The tiny plants you’ve ignored all your life are waiting for you. I’m trying desperately to find a live hornwort (the bryophyte type, not the hornwort that grows in aquariums). Is there an area in or near Augusta County where I could find a sample? WOW, 300 specimens! As a “mosser” in Virginia’s Coastal Plan Region I hope you will give updates on your project, especially the rare and unusual finds. 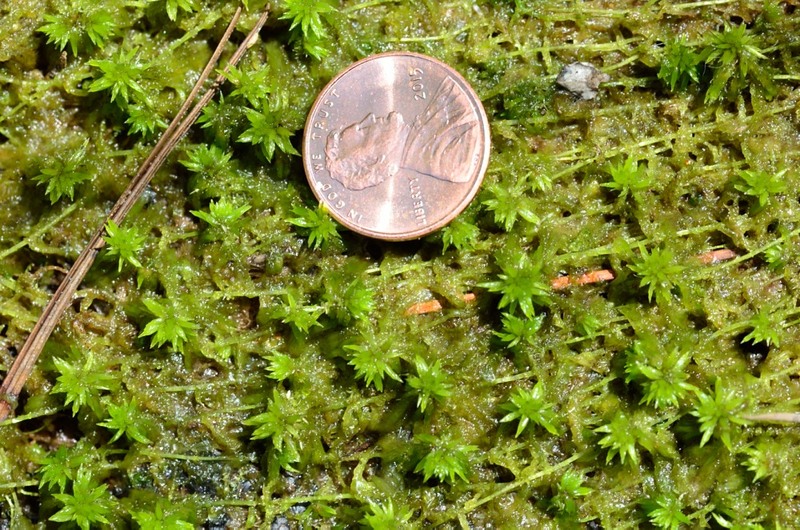 Any recommendations on a bryophyte taxonomic key? I have been collecting bryophytes mostly in virginia’s Coastal Plain for almost 3 years .. very interested in getting conversation going among the few of us out there .. Mary Lou Ward .. I hope to hear from you!